"This is such a classic go-to potato side dish recipe. There are only a few things you have to do, and if you do those things, you're talking intense potato side dish pleasure! The best roasted red potatoes start with a heavy roasting pan, a generous amount of olive oil, and enough time to roast the potatoes dark and rich." Pour olive oil into a heavy baking dish (such as an enameled cast iron dish). Place potatoes into the baking dish and toss to coat with olive oil. Sprinkle with fresh thyme sprigs, kosher salt, black pepper, cayenne pepper, and red bell pepper pieces. Bake in the preheated oven for 30 minutes. Toss vegetables to turn over. Some potatoes may stick; don't try to turn them. Return to oven and bake for 20 more minutes. Toss potatoes again, turning potatoes so unbrowned sides contact the bottom of the dish. Continue baking until potatoes are browned and tender, about 15 more minutes. Turn oven off and leave potatoes in the oven for 15 more minutes. Toss once more and adjust levels of salt, black pepper, and cayenne pepper before transferring potatoes to a serving bowl. 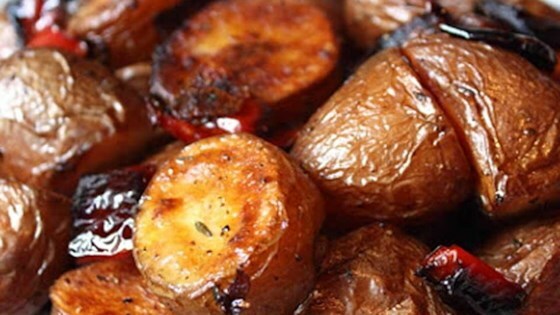 See how to make amazing oven-roasted red potatoes. Terrific recipe! It is absolutely delicious and I highly recommend it. Thanks Chef John. LOVE! My husband and I fight over the crispy potatoes and this recipe helps make them all so crispy and yummy!!! Just like the video suggested, I used fresh rosemary instead of thyme because that's what I had. These were a great side-dish! OMG!!! About says it all. I left off the thyme and bell peppers ( my husband doesn't like green things ) and added some garlic. These are now our favorite potatoes. Thank you so much Chef John! !